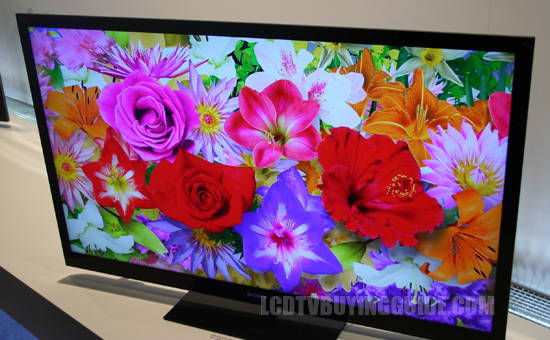 This LED backlit LCD TV succeeds the KDL46EX620 from last year which was a successful TV at its price point. Though we are not overwhelmed by the picture quality of this unit we do like the value of this 46" offering. As we review the features, we note some improvements in processing speed and the video engine chip set used. Contrast degrading at angles is another issue from the matte finish anti glare screen. It is not easily overcome so we recommend this TV for darker rooms. Colors do pop more on this model than on last years which is an improvement but we would still like to see more saturation. I guess that's why this is a great value model. Sometimes dark shadow detail is a bit lacking in the KDL46EX640 as the screen filter on this TV causes a hazy appearance with some programming on the screen. One remedy to this problem is turning up the Brightness setting some. This will cause better definition in dark areas, but a less penetrating black level and contrast. The Motionflow 240 feature does do a good job in fast action scenes of reducing jerkiness and smoothing out images, but it has its negative side as well as it clarifies the background too much and takes out artistic blur with film based movie material. Aside from that, it is great with sports and other fast action. The Smart TV function called the Sony Entertainment Network is very average in terms of offerings. It does not really deliver much value outside the key core Smart TV offerings such as Netflix, Hulu, Pandora®, HuluPlus™, Amazon Instant Video, YouTube™, Slacker® Internet Radio, Crackle and social networking through Facebook and Twitter. The Web browser is less than good, it's not even worth accessing. See our complete Sony SEN review here. The design of the TV is very nice and quality for any setting with around a 1 inch frame which has a texture that is unusual for TVs these days. I like the design and looks. Depth is avg. at 2.4 inches. The menu and remote function are well thought out and easy to use for the most part, though the menu is far from being our favorite. At $900 this Sony TV is a compelling value especially if you do not care about 3D capability. It should be a very strong seller at this price. Competition comes from the LG 47LM6200 and the Samsung UN46ES6100 to name a couple which sell for $100 more.